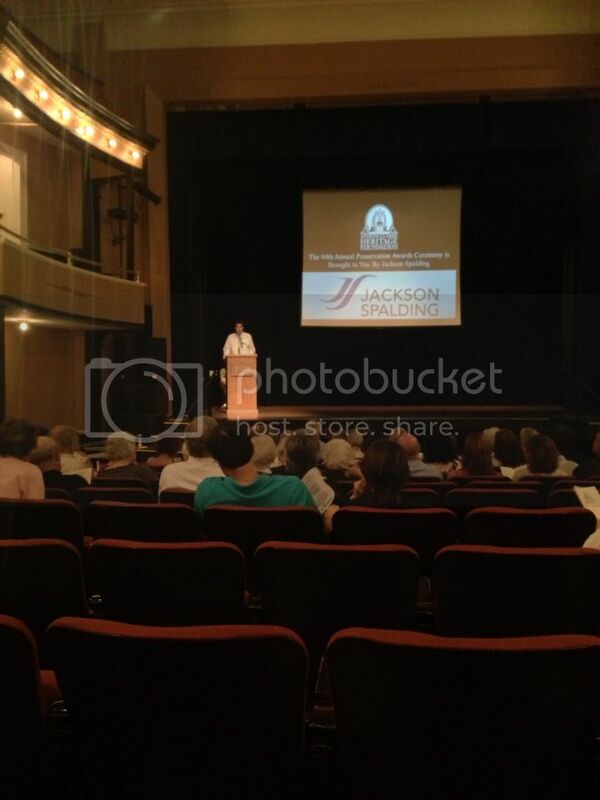 Monday night, Spencer attended the 44th annual Athens-Clarke Heritage Foundation Historic Preservation Awards. Held at the Historic Morton Theatre, this ceremony brings together citizens in our community committed to the preservation of some of the oldest homes and buildings for the next generation of Athenians. Awards are given out to organizations and individuals for Outstanding Achievement, Grassroots Preservation, Outstanding New Construction, Outstanding Publication, Outstanding Rehabilitation, and Outstanding Stewardship. There is also a President’s Award and a semi-annual Phinizy Spalding award named after the former UGA Professor who sparked historic preservation in Athens by establishing the Historic Cobham foundation. He was also a leader in the Georgia Trusts for Historic Preservation and the Athens-Clarke Heritage Foundation. This year’s awards featured projects at notable community landmarks and homes in historic neighborhoods. UGA Campus landmarks like Legion Pool, the Alpha Delta Gamma sorority house and the Georgia College of Art and Design won awards for their construction and preservation. Homes on Barber Street and Yonah Avenue won awards for their rehabilitations that provided modern amenities and living spaces while preserving the character and history of their neighborhoods. Social media also made its first appearance at the Preservation Awards with the “Growing Up in Athens, GA” Facebook page winning Outstanding Publication. To conclude the ceremony, the Phinizy Spalding Award was awarded to Athens-Clarke County Commissioner Kathy Hoard for her many years of service in historical preservation in Athens. The awards were a great opportunity for the community to get together and celebrate the hard work of organizations and individuals in our community who are committed to preserving Athens’ rich history for the next generation of Athenians. If you would like to get involved with the Athens-Clarke Heritage Foundation, check our their website and Facebook page. Have a great week! Outstanding Achievement: Kristen Morales and Buena Vista neighbors: Buena Vista Heights Local Historic District Designation. Grassroots Preservation: Sarah and Todd Baker and Grady Thrasher and Kathy Prescott: Friends of Legion Pool. Outstanding New Construction: Alpha Gamma Delta and E.L.T. Construction Services for an addition to the Thomas Carithers/AGD House. Outstanding New Construction: Donald Scott and Bork Architectural Design for 378 Yonah Ave. Outstanding Publication or Program: Jerry Crawley, Roy Moseman and Johnny Kesler for “Growing Up in Athens, GA” Facebook page. Outstanding Rehabilitation: Chris Peter and Peterson Properties, LLC for 290 Barber St. Outstanding Rehabilitation: UGA Office of University Architects for Memorial Hall. Outstanding Rehabilitation: Chris Lloyd and John Barrett, Matheny & Armentrout Architects and Koons Environmental Design for Marker 7 Coastal Grill. Outstanding Rehabilitation: Lorinda and Peter Crane, Nackashi Design and Construction Co. for 297 Franklin St. Outstanding Rehabilitation: Richard Hathaway and MIchael Daniel, The Cheney House. Outstanding Rehabilitation: UGA College of Environment and Design, UGA Office of Sustainability and UGA Office Of University Architects for the Jackson Street Building (formerly Lamar Dodd School of Art). Outstanding Stewardship: First AME Church at 521 North Hull St. Outstanding Stewardship: UGA Facilities Management Division for the North Campus fence rehabilitation. President’s Award: David C. Barrow School.